Over six million Jews were murdered by the Nazis, and they were murdered in the most degrading of all possible conditions. The ideology of National Socialism had declared that they were subhuman and therefore unworthy even of the right to exist, and so by the millions they were murdered. But make no mistake; this was not the sudden violence of a rioting and lawless mob. No, the extermination of the Jews was carefully planned and methodically carried out over many years by well-educated professional men who loved their families, and were kind to their pets, and served their nation with skill and determination. These men went to concerts and plays; they went to fine dinners and took vacations with friends; they read poetry and classical literature and taught their children to play Bach and Beethoven. And they coldly, systematically murdered human beings by the millions with a clear conscience, because they found a way to convince themselves that those who were dying were beasts rather than men. But my friends, we do not have to look back to Nazi Germany and the death camps to find such contempt for God. No, we can find it right here among us, in the Land of the Free and the Home of the Brave. On 22 January 1973, the Supreme Court of the United States, by a 7 to 2 vote, announced that it had discovered in the Constitution of the United States a previously unknown right of mothers to murder their children, and in the thirty-eight years since that national disgrace, we Americans have murdered more than 50 million human beings in the womb, with some estimates placing the butcher’s bill closer to 60 million. In other words, in the name of personal liberty and freedom of choice, we Americans have now exterminated more human beings than presently live in Spain and Ireland combined. How could man, how would we, have such utter contempt for man? Because we have reached the point of contempt for God. For decades before the infamous decision in Roe v. Wade, men and women of the radical and secular American Left -- taking their lead from the revolutionaries of the often violent European Left -- had been building a case to demonstrate that Biblical religion and the God revealed in the Bible are the enemies of human freedom. The default setting of the Mandarins of our high culture -- in our universities, in journalism, in entertainment and the arts, and in politics of the Left -- is that the human person is an autonomous individual free of all obligations to others, who must provide for himself the meaning of life and who has only the duty to pursue pleasure and self-realization wherever they may be found. Moreover, the secular mind holds that there is no universal moral truth, and even if there were, we could not know it; therefore, each person must find his own truth. This perverse philosophy was aptly described by Professor Allan Bloom (in The Closing of the American Mind) as debonair nihilism, and supported by the sexual revolution and the counter-cultural movements of the ’60’s, this vision of human life declares that unborn children are simply lumps of tissue that may be surgically removed from the mother’s body for any reason she may have. In fact, unquestionable commitment to this hateful ideology is now so deeply entrenched in the mind of the Left that we may call support for unrestricted abortion on demand the sacrament of secularism. Think back to Nazi Germany: the atrocities committed against Jews were planned and executed by law-abiding and seemingly civilized men, and now we are doing exactly the same thing. Supported by unjust laws, our cultural and political elites are almost wholly captive to a hateful ideology that declares certain classes of human beings not to be human, and in the name of that ideology we are engaged in bloodletting of unimaginable proportions. Worse still, this abattoir of human misery is aided and abetted by false preachers in much of what remains of liberal Protestantism, who seek to excuse abortion as a private and tragic choice that is sometimes sadly necessary in difficult circumstances. But, friends, murdering innocent children is never necessary. And after nearly 60 million such murders, we’re no longer talking about private tragedies; in fact, after four decades of judicial murder, we’re facing a civilizational crisis. Last week in Philadelphia, the depraved consequences of a generation of genocide were finally exposed to public view. We learned that a licensed medical doctor named Kermit Gosnell ran a chamber of horrors worthy of Dr. Mengele’s obscene experiments at Auschwitz, and this he did with impunity for decades because public officials looked the other way year after year after year. And this they did because abortion is considered absolutely sacrosanct by those who make and enforce the laws in too many parts of our country. Now, you might be tempted to think that the slaughterhouse of Kermit Gosnell is an extreme example that we may dismiss because it is so grotesque, but the only difference between what happened in Gosnell’s death chamber for decades and what is happening every day in every so-called clinic where abortions are performed is a difference of degree, not a difference of kind. How could man, how could we, have such utter contempt for man? Because we have reached the point of contempt for God. My friends, the United States of America is drowning in the blood of tens of millions of murdered babies who are martyrs to a loathsome ideology which dehumanizes us by allowing us to dehumanize them. And the first step away from this abomination is for each and every one of us to refuse to consent to or cooperate with in any way the lies on which the ideology of abortion stands. Let’s start with language. Abortion is not about the freedom to choose; it is about the license to kill. Abortion is murder. It is murder most foul, and it must stop. In the Name of God, it must stop. In the name of Man, it must stop. In the name of all that is holy and good and true and beautiful, it must stop. And so I beg you: never consent to abortion. Never cooperate with abortion. Never excuse abortion. Never vote for a politician who will support abortion. Never remain silent when your family and friends and neighbors and colleagues consent to abortion or decide to vote for a politician who will support abortion. Never accept the lie about human nature and human life which is required to imagine that a human child is a lump of tissue. Never be seduced by the seemingly civilized men and women who fill the air waves and the lecture halls and the court rooms and the political chambers and even, sometimes, the pulpits of this land with the lie that we can murder our children in the name of human freedom without becoming the same kind of monsters who marched millions of Jews into the gas chambers of the Holocaust. Next, let’s think about what we can do to promote a culture of life. We can support every effort by the Church and by pro-life groups to bear witness to the truth of the Gospel of Life. We can support programs that provide practical assistance to women with unwanted or crisis pregnancies. We can support adoption programs, chastity education, and a new counter-cultural movement informed this time by the Gospel which sets us free from slavery to sin. 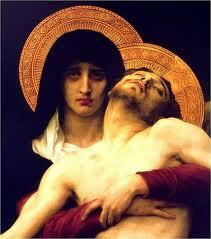 We can give pastoral care to those wounded by abortion, starting with the mothers who killed their children. We can bear witness to anyone who will listen that children, even in the womb, are human persons with inalienable rights, starting with the right to live and be nurtured rather than to be murdered, dismembered, and cast away as medical waste. To paraphrase John Paul the Great: In the face of more than 50 million murdered children, the mind and heart and soul feel an extreme need for silence. Silence in which to remember. Silence because there are no words strong enough to deplore the terrible tragedy of abortion. Let us dare to hope that one day, a day sooner rather than later, a great national monument will be raised in memory of the tens of millions of Americans who have died and are continuing to die in the holocaust of abortion. Let us hope that Americans of every creed and color, of every party and persuasion, will one day come to such a place of silence and remembrance to honor those who lives were taken from them by others who denied their humanity. But until the murder of the unborn is ended and until such a shrine of silence and remembrance exists, we can hasten its coming by never being silent about abortion, never allowing our fellow Americans to forget that a holocaust is going on among us right now, every day. 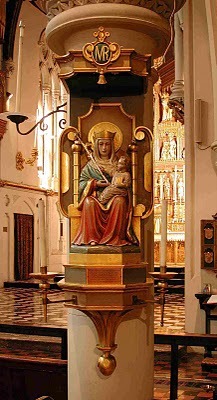 And even as we speak out about abortion in private conversation, in the public square, and in political action, let us now, in this holy place of remembrance, keep watchful silence in memory of the millions of martyred children and beg for the mercy of God upon our nation for this crime against God and man that cries out to heaven for His justice. Today in Rome and in England, something momentous occurred. In accordance with the Apostolic Constitution Anglicanorum Coetibus, the Holy See created a new canonical structure in England and Wales for Anglicans who want to be Catholics. 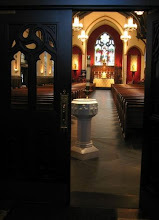 It is called a Personal Ordinariate, and it is essentially a non-territorial diocese which allows Anglicans who become Catholics to preserve their Anglican parochial, liturgical, and devotional identity in the Catholic Church. The Ordinariate is named for the Mother of God as she is venerated at the ancient English shrine of Walsingham, and it has been placed under the heavenly patronage of Blessed John Henry Newman, the Anglican priest who became a Catholic and then a priest and a Cardinal of the Catholic Church in the mid 19th century. This is a bold move on the part of Pope Benedict XVI. In a single stroke, Benedict has broken the logjam of official ecumenical conversations which began with such promise in the 1960's but which had lately become a moribund joke of official niceties being exchanged to no end except continuing the never-ending conversation. Moreover, if Anglican Christianity ever had a genuine claim (and it is doubtful that it ever did) to being something other than simple Protestantism in Catholic drag, that claim has long since been abandoned by almost every Anglican everywhere, starting with the hierarchy of the Church of England. The apostasy from Christian faith and life which is making shipwreck of Anglicanism throughout the First World is yet another reason for serious Christians within the Anglican Communion to find their true and lasting home in the Church from which their ancestors were separated in the 16th century. And now Pope Benedict XVI has provided the means for them to do so. Look for other ordinariates to be established in the United States, Canada, Australia and perhaps elsewhere in the coming months.